It is difficult to believe that in 2013, hundreds of workplace-related falls and injuries have been related to the use of ladders. Fall accidents often involve workers who were standing on ladders, or coming down/going up ladders. The National Institute of Occupational Safety and Health recently released a smartphone application that is specifically geared to help workers avoid ladder accidents called Ladder Safety app. The app, available for free download, is designed to allow workers to check the angle of the extension ladder that they are using to help avoid accidents. The app makes use of audio and visual signals that make it easier for workers to use extension ladders safely. 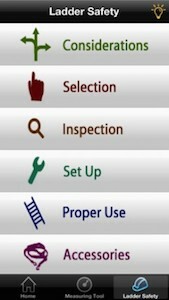 The worker is given feedback about positioning the ladder properly, and the app also gives references as well as safety advice for selecting, using and inspecting a ladder. In the construction industry, ladders are a major source of workplace-related fall accidents, and very often, these accidents are caused because the ladder is not positioned properly. Determining the correct angle is crucial to ladder safety, and any discrepancy can lead to the worker falling from a height and suffering injuries. The Ladder Safety app helps you to position ladders in a manner that will not cause a fall. Workplace-related falls from ladders can cause fractures, broken ribs, head injuries and back injuries that can have a long-term impact on a worker’s health. For instance, if a ladder has been placed at too steep an angle, it can fall backward when the ladder is in use. If the ladder is too close to the wall, then the ladder can actually slide out from beneath the worker while the worker is at the top. This can expose the worker to the risk of fractures and other injuries. Michael Parsons is an Atlanta workers’ compensation lawyer representing injured workers in the metro Atlanta region and helping them recover the workers’ compensation benefits that they have earned. Contact us to see if you have a case!